Try some of these clever and imaginative ways to host a school drive, and you’ll definitely increase your success. No Kid Hungry & Sodexo Stop Hunger Foundation have joined forces to provide educators with the tools and resources to learn more about how being hungry makes it hard to learn, how every student should start the school day with breakfast, and how students and teachers can work together to ensure that no child in America goes hungry. The hunger statistics in America are staggering. Nearly 50 million Americans—including 13 million children—live in households that struggle with hunger. Every city, community, and school is affected in some way, making hunger one of the biggest challenges in the country. A filling dinner…a healthy lunch…a good breakfast to start the day—these should all be commonplace for all kids, but unfortunately they’re not. 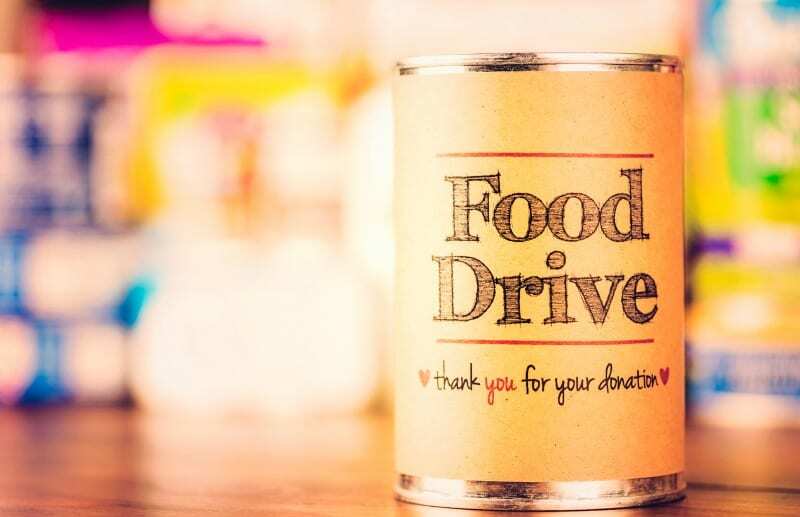 While it might seem like there’s not much you can do on your own, schools can do some pretty powerful work when they come together for a food drive. For instance, according to United States Department of Agriculture stats, every 300 pounds of food makes 250 meals possible! Since an average can of food weighs one pound, your entire school and community can quickly make a big impact. Food drives are an essential and important part of every local food pantry’s success. And with a little bit of creativity and imagination, you can make your food drive fun and entertaining, thus increasing involvement. Try one of these ideas to double or triple your donation results. 1. Put the food on display for the entire school to see. When students can set their sights on a big goal and then watch the progress, it’s going to increase participation and overall success. This is easy to do when it comes to holding a canned food drive because when everyone gets involved, it really makes a strong visual impact. How to Pull it Off: You need a goal first. Does someone have an old pickup truck not being used right now? Or how about a mini school bus that is no longer in service? (Or a BIG bus if you’re feeling ambitious like these students in Seminole, Texas.) Have it parked right there on the school grounds as a constant reminder to your students to keep bringing in items to fill it up! Another good display idea: surround the school with cans! For this, use masking or painters’ tape to section off a path throughout the entire school. Then, as students bring in canned goods, they can keep the trail going until it makes it all the way through! 2. Hold a special charity culinary event. When you serve people a delicious, amazing, scrumptious meal, it helps them realize just how valuable good food is. You can check out national culinary events around the country as part of the No Kid Hungry’s Friendsgiving, or create your own event on a smaller scale during any time of the year. How to Pull it Off: First, you need a good theme. If it’s Thanksgiving time, the theme is easy. (You can see how one blogger did a Friendsgiving here.) For other times of the year, you can do a pie social, spaghetti dinner, or gourmet mac and cheese night. If you’re holding the event at school, try contacting area restaurants or grocery stores to see if they want to get involved by donating supplies or food. You want to get the food as inexpensive as possible in order to raise the most money. Then get volunteers (maybe even teachers) to serve the food, and sell tickets in advance. Finally, have people bring a can of food for the event, where you can collect all the items for a local food pantry. Don’t forget to advertise that all proceeds will benefit an organization like No Kid Hungry. 3. Offer a fun, messy, and completely ridiculous incentive. 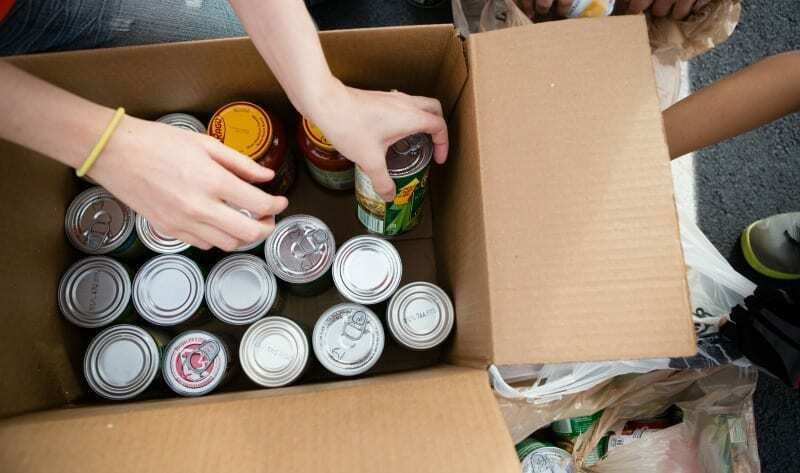 How to Pull it Off: Food pantries are not allowed to put out expired items—they have to toss them. Use this an educational opportunity and incentive for your students! Set a high goal, like collecting 2,000 nonperishable items. As the items come in, be sure to sort and check expiration dates. Any item that is past expiration gets put in a separate pile. Once the food drive is over and the goal is met, open up those expired items and let them flow (food fight!) during an all-school assembly. Pro tip: You’ll want tarps, plastic, and maybe even a little kiddie pool to catch the mess. 4. Put up a giving tree decorated with wish list items from your local pantry. You’ve seen them—the trees that go up with a tag, outlining a “wish list” of a local child in need. The holiday giving tree is definitely a concept that works, so it’s time to borrow it to collect items for the local food pantry. 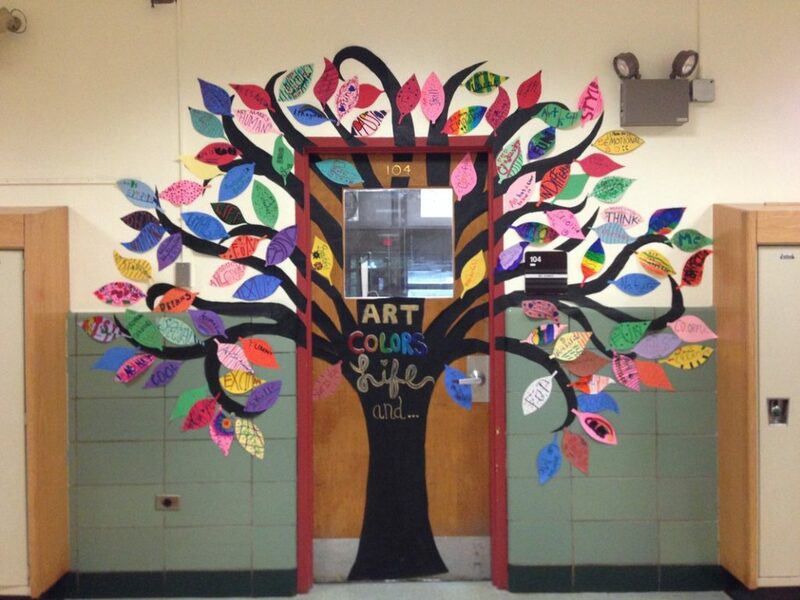 How to Pull it Off: Decide if you want to use a fake tree (surely someone has a Christmas tree to lend) or create a tree on a bulletin board like the gorgeous example below from the art room of Ms. Gomez. Then hang different tags on the tree that highlight some of the most needed items at your local food pantry. 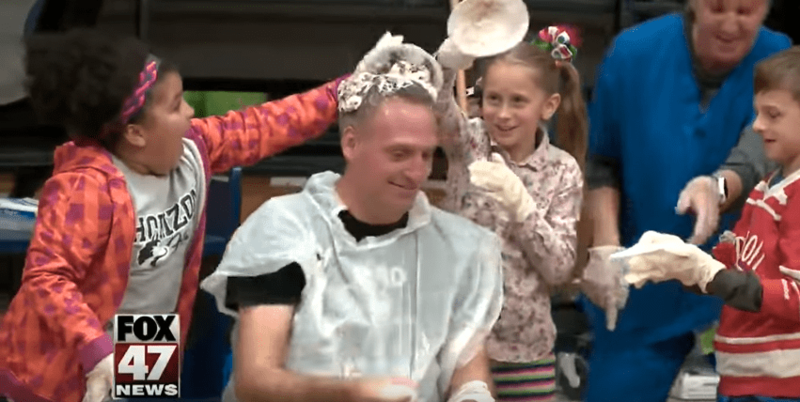 This is a great way to get your students involved. Have them research the most requested items through interviews with local experts. This concept would work great at a family event like a school concert or dance. This way, the adults can pick out a tag or two with their kids. 5. Make your food drive 100% virtual. You’ve heard of online wish lists and gift registries, right? You can either go on a website or into a store and choose items you want people to get you, and then it’s nicely organized online. Well, who says you can’t use this same concept with food? Go for it! How to Pull it Off: Wal-Mart and Target both have a registry option where you can use their handy-dandy scanner to get items on your wish list. Turn this into a project for your student council or an advisory committee. Have them research the most in-need items at your local food pantry. Then take them into the store and have them put these items on a school wish list. Give parents the option to shop in person or online, sending the items directly to the food pantry. You can do something similar with online registries like Amazon.com. Be sure to promote your wishlist registry on your website, in school newsletters, and in teacher emails. Parents can use a regular reminder that helping with the school food drive is only one click away! Get more resources on our Teachers Guide to Understanding Childhood Hunger page.